Workshop: Transitions and Transformations - Thriving in the Midst of Change from Ready2Go Marketing Solutions, Inc. There is great power in believing you can fulfill your own dreams, and your degree of personal confidence may be the all-important key that unlocks this power. Still, the sad truth is that all of us have been plagued at one time or another by doubts about our ability to make a difference in the world. At times we have felt our confidence wane against the challenges and obstacles we have faced in order to have the lives we want. Only with confidence can we achieve our true potential – whether in relationships, a career, our material circumstance, or even just our self-image. 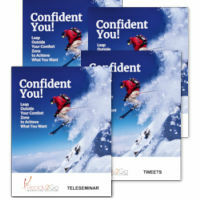 When we lack confidence, we feel stuck in our ability to obtain what we want for our lives. Lacking confidence is like a needle that keeps popping the balloons of our desires. 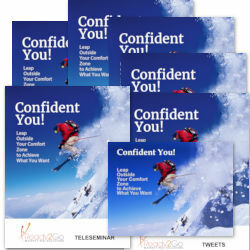 In the same way that you have convinced yourself that you lack confidence or lack the degree of confidence necessary to be successful, you can also learn to have and access unlimited confidence. All it takes is getting in touch with your true self and changing the way you think and feel about who you really are. Once you make this improvement, you can confidently face the challenges life presents with new-found belief in your capability to do so. Through a more confident you, you can stop hesitating on the actions you need to take to achieve your goals. You can side-step fear and be comfortable living with risk. By assessing your whole being – your mind and its thoughts, your emotions and what you feel, and your body and the behaviors it expresses - can you discover the source of natural confidence that resides within you. Just think what will be possible for you in your life when your own natural confidence is finally tapped! Participants use guided imagery to get in touch with their authentic self. Participants practice focusing their minds on what’s right rather than on what’s wrong as a means of training it to be more positive and therefore confident. Participants experience the power of emotions and reflect on their ability to function confidently under varying emotional conditions. Participants reinforce their self esteem. Participants reflect more deeply on the significance of these terms and realize that people with ‘learned optimism’ take control of their reactions, have the ability to make choices, and respond more positively to challenges. Participants complete several short goal setting exercises that will help establish a focal point for their confidence. Participants explore the risks and benefits to taking action on their big goals. 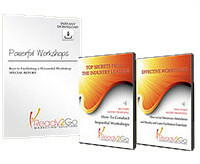 Participants deepen their confidence by appreciating their ability to inspire others and to be grateful for the unique qualities that each of us possesses. Participants consider changing how they view the idea of failure. By the end of the workshop, participants will be able to recognize how confidence is necessary to pursuing what they are passionate about so that they can achieve the successes they imagine for themselves. Participants will also see the connection between the internal level of confidence they feel and the outer level of influence they can have on the world around them. They will be able to explain how confidence can be accessed through their authentic selves and that a positive perspective around who they are and what they are capable of achieving is something that can be learned. Every success in life comes through believing in yourself. Success happens because we believe we can accomplish it. Confidence is the gateway to that success. It is necessary in order to live the life we want and to fulfill the dreams we desire to obtain. With confidence, we can steadily progress towards our aspirations and rise up to meet any adversity. Confidence enables us to be our true selves, and it can also inspire others through the quiet belief we possess in our own abilities. Participants in this workshop will gain a greater awareness of what confidence truly is, where it comes from, and how it can be continually sustained so that we can boldly progress towards our goals. Discovering your authentic self and the natural source of confidence deep within you. Developing a healthy belief in your ability to be confident in any situation. Recognizing how your level of confidence affects your willingness to take action toward your goals. Understanding the significance a positive perspective of yourself and your life has on the degree of confidence you do or don’t feel. Realizing that through the confidence you express to others do you have the ability to inspire them to make a difference in their lives.